Below you can find all available LG G4 Beat firmware and required software with tutorial to install it. But I recommend you to recall main features and specifications of this smartphone. LG G4 Beat was released in July 2015. The smartphone has different names for different regions. For example, LG G4s, LG G4 Beat, LG G4 Beat Dual SIM H735DS, LG H735. You need to find firmware for your model, and no other way. If you install LG firmware not for your smartphone, it can be a "brick". The smartphone has really good specification list even today. It comes with 5.2 inch Full HD display, Snapdragon 615 CPU, 1.5GB of RAM and 8GB of internal storage. Also, there is 8MP (13MP for Latin America) rear camera, and 5MP front camera. As you can see, LG G4 Beat is very good for today. That’s why many people still use it as a primary smartphone. However, out of the box software is Android 5.1 Lollipop. If you want new Android version, you should wait for OTA update or install firmware by yourself. Some people look for LG G4 Beat firmware to fix errors and solve problems with smartphone. Anyway, below you can download LG G4 Beat firmware. As I already said, there are firmware for different phone models. 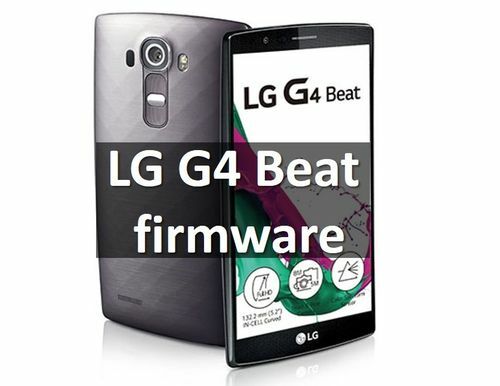 Please download LG G4 Beat firmware for your smartphone. Also, you can read our article how to install KDZ firmware. If you have any questions, please write comments below. We will try to help you to install LG G4 Beat firmware.